On Saturday, July 7 the biggest cycling event in the world takes off in Noirmoutier, taking the riders to Paris after three weeks of racing through France. The most legendary race of the calendar promises a big fight for the iconic yellow, green, white and polka-dot jerseys. This guide will take you through the history, the route and the contenders of the 105th Tour de France. January 1903: After a dispute with competing magazine Le Vélo, the French magazine L’Auto decides to gain popularity by organising a cycling race longer than any race at that point. It had to be heroic enough for the magazine to increase its circulation. No one knew back then that this was to be the biggest cycling race in the world. The first edition consisted of only six stages, covering a total distance of no less than 2428! kilometres, and was won by Maurice Garin. The circulation of L’auto increased more than sixfold, and thus the race was deemed successful enough to be organised again in the year after when Henri Cornet won the race at the age of 19. To this day he is the youngest victor of the race. The oldest winner is the Belgian Firmin Lambot, who won the Tour in 1922 at the age of 36. In the meantime, the race increased in length as more, though shorter, stages were added until the event eventually was spread out over 21 race days, as well as 2 rest days. The traditional finish of the race is, since 1975, situated on the iconic Champs-Elysées in Paris. Throughout the years the race was won by the biggest names in cycling, including Bernard Hinault, Eddy Merckx and Jacques Anquetil, who all won the race five times. This year Chris Froome can add his name to this list if he manages to win his fourth consecutive Grand Tour. Eddy Merckx also holds the record of most stage wins with 34, although Mark Cavendish (30 stage wins) will attempt to break this record this year. The Tour hosts many cycling legends, among them amusing stories like that of Abdelkader Zaaf, heroic ones like that of Wim van Est, or dramatic ones like that of Tom Simpson. The Algerian cyclist Abdelkader Zaaf attacked with 200 km to go in the thirteenth stage of the 1950 Tour de France. In a heat of around 40 degrees Celsius, he was in front with Frenchman Marcel Molines. Due to the heat and the enormous advantage the two got, Zaaf stopped to accept a bottle of wine, he drank it and even opened a second bottle. Completely drunk he got back on his bike, but soon realised he’d rather sleep a bit under a tree. After a while, people found him and woke him up so he could continue the Tour, but he drove off in the wrong direction. Eventually, he was taken to the hospital for a check-up and had to leave the Tour, but his fame as a cyclist was acquired. Years later he declared this was not the real story, and that he was handed a liquid that was close to pure alcohol instead. However, the legend was born. A year later the Tour formed the scene for another remarkable story. Wim van Est finished off a day in the breakaway in stage 12 of the 1951 Tour de France, thereby being the first Dutchman to wear the yellow jersey. He could not enjoy his performance for a long time, as he crashed on the descent of the Col d’Aubisque a day later and fell 70 metres down into a ravine. He survived the fall and was eventually brought back to the road after people helped to pull him up with a chain of tires. Despite the rider wanting to continue, he was brought to the hospital and had to abandon the Tour. Later he played a role in an advertisement campaign by Pontiac, the watch supplier of the Dutch team that year, with the legendary phrase: "Seventy meters deep I dropped, my heart stood still but my Pontiac never stopped". The last ten years have seen their own remarkable stories, that will be told years from now. Think of Chris Froome running up the Mont Ventoux, Vincenzo Nibali destroying the competition on cobblestones and Andy Schleck’s chain falling off on Port de Balès. Every year there is a book to write on the stories from inside the peloton, and exactly that is what makes the Tour de France stand out as a race. 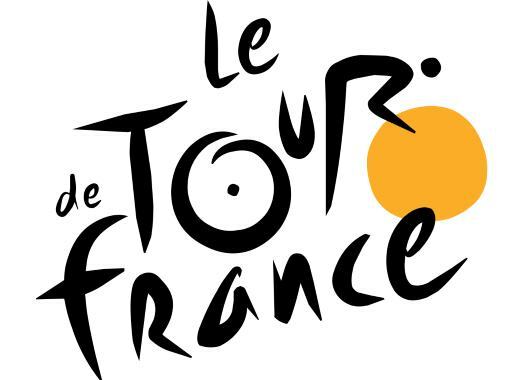 The 105th Tour de France takes off in Noirmoutier-en-l’île, in the Vendee region in the west of the country. As Direct Energie has its roots in this region, we will definitely see them fight to get into the first breakaway of this year’s Tour de France. The riders will cover 201 kilometres, 110 of them along the Atlantic coast before a flat finish awaits them in Fontenay-le-Comte. On paper it seems like a sprinter will take the first yellow jersey here, or will we see the bunch break up in echelons along the coast? 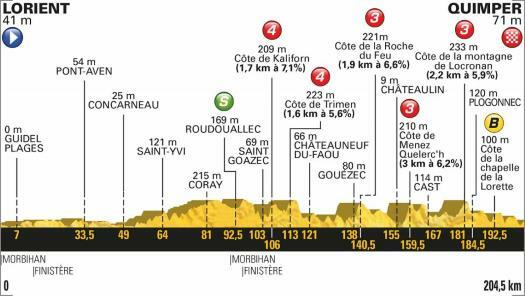 Stage two will take the riders from Mouilleron-Saint-Germain to La Roche-sur-Yon, where we will most likely see another peloton sprint after a 182.5-kilometre long flat course. In order to hold on to the yellow jersey, the race leader, after the first two stages, is going to need a strong team around him, as stage two is the dreaded team time trial. In and around Cholet the teams will battle for every second on the 35-kilometre course with only 10 corners and even a small climb in it. It is a course for the real powerhouses, and some favourite’s chances of winning the yellow jersey are going to be seriously damaged here. After the Vendee the peloton heads north, towards Brittany. In stage four the riders can lick their wounds after the TTT, as the 195-kilometre long stage from La Baule to Sarzeau is almost entirely flat. Stage five will be the first stage with some more serious climbs, with 5 categorised climbs on the course from Lorient to Quimper (204.5 km). An attacker can already lay a foundation to wear the polka-dot climbers jersey for a few days. However, with 20 kilometres to the line after the last ascent, another sprint with a reduced bunch is not unlikely. The sixth stage might be the second battle between the GC contenders, as the ascent of the Mur de Bretagne has to be climbed twice in the final 16 kilometres. On top of the second climb, the finish line is drawn. The last time the Tour visited the Mur de Bretagne, Alexis Vuillermoz took the biggest victory in his career. After the spectacle in Brittany, the peloton will head from Fougères to Chartres, famous for the Cathedral of Our Lady of Chartres. With 231 kilometres this is the longest stage in this year’s Tour de France, and, due to the flat profile, will most likely end in a group sprint. The same can be said of the next stage. On France’s national holiday, fireworks can be expected from the sprinters after a 181-kilometre flat race from Dreux to Amiens Metropole. 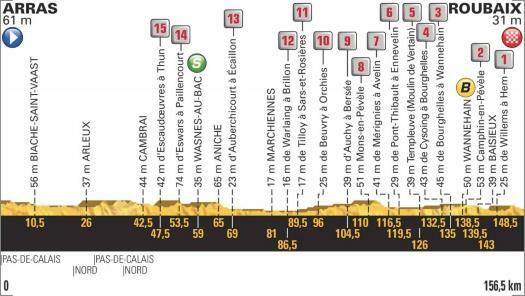 However, real fireworks are expected in stage 9, as the peloton takes on a short but intense course from Arras to Roubaix. On the route are no less than 15 cobbled sections known from Paris-Roubaix, including the dreaded Mons-en-Pevèle. This is a stage that all the GC contenders are afraid of since one flat tire at a bad moment can cost minutes here. Lars Boom won the last cobbled stage in the Tour de France back in 2014, while Vincenzo Nibali laid the foundation for his overall win in the cobbled stage to Arenberg that year. After the cobbles of stage nine, the riders can enjoy their first well-deserved rest day in Annecy. There is not much time to recover though, as the peloton is sent into the Alps the day after. The first mountain challenge is a 158.5-kilometre stage that takes the riders over 5 categorised climbs, one of the 4th Category, three of the First and one of the Hors Category. The final summit, that of the Col de la Colombiere (7.5 km at 8.5%), is only ten kilometres from the finish in Le Grand Bornand. The first summit finish is planned for the next stage, as the line is drawn on top of the ascent to La Rosière in stage 11. The stage is only 108 kilometres long, but covers one Second Category and two Hors Category climbs, before finishing on a First Category ascent. This exact stage was raced recently in the Dauphine, where Pello Bilbao (Astana) was victorious. The stay in the Alps is concluded with a summit finish on the mythical Alpe d’Huez. Starting in Bourg-Saint-Maurice Les Arcs the riders will take on the Col de La Madeleine (HC, 25.3 km at 6.2%), the Lacets de Montvernier (2nd Category, 3.4 km at 8.2%) and the Col de la Croix de Fer (HC, 29 km at 5.2%) before reaching the final climb to Alpe d’Huez (HC, 13.8 km at 8.1%) with its iconic 21 bends. The Alps are left one day later, as the sprinters can show their prowess, and freshness, again on the 169.5-kilometre flat course from Bourg d’Oisans to Valence. Stage 14 takes the peloton to Mende, 188 kilometres after starting in Saint-Paul-Troix-Châteaux. On the climb to the finish, the Cote de la Croix Neuve, Stephen Cummings beat Thibaut Pinot and Romain Bardet after a tactical race back in 2015. On Sunday, the peloton leaves Millau for a 181-kilometre stage to Carcassonne, taking the riders over a challenging course. However, with the final summit at more than 40 kilometres from the line, a breakaway might go for the win here. In the historical city of Carcassonne, the peloton can relax and enjoy its second rest day. The last week will take the peloton through the Pyrenees, where the battle for the GC will be decided. This already starts in stage 16. 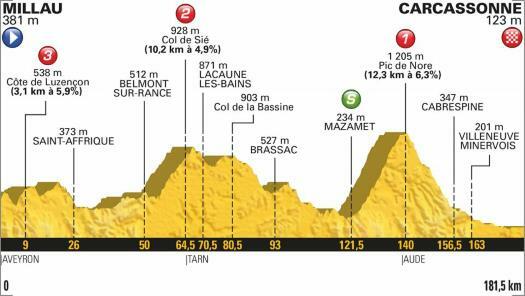 After leaving Carcassonne, the riders cover a 218-kilometre stage with 5 categorised climbs. The summit of the last one, the Col du Portillon (8.3 km at 7.1%) is at only 10 kilometres from the finish line in Bagnères-de-Luchon. 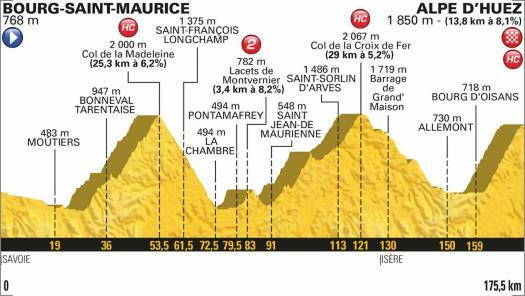 Ever since the release of the stage profiles all eyes have been set on stage 17. With only 65 kilometres to cover, this is certainly a special stage. It is the shortest, non-time-trial stage in the last thirty years. The stage immediately starts uphill, with the Col de Peyresourdes (First Category, 14.9 km at 6.7%). After the descent, the next challenge awaits, the Col de Val Louron-Azet (First Category, 7.4 km at 8.3%). 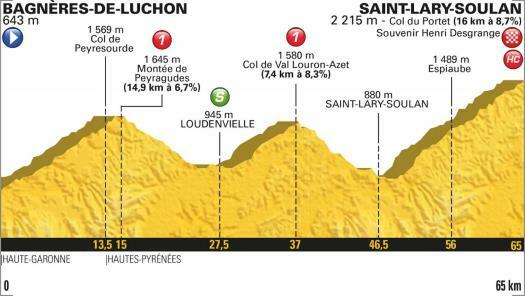 The final ascent makes its debut in the Tour but has nevertheless been dubbed the “next Tourmalet” by Christian Prudhomme, director of the Tour. The Col du Portet (HC, 16 km at 8.7%) is also the highest point of the race this year. What makes the stage even more special is the starting order. The first twenty riders in the GC will start first, followed by the next twenty. Then the riders will start in groups of up to forty. This will add a different layer of tactics to the race, as team leaders have to decide whether to wait for their teammates or not. Stage 18 offers the sprinters the last chance before their final showdown on the Champs-Elysées in Paris. The race from Trie-sur-Baïse to Pau is a day to recover and prepare for the final mountain stage, and will most likely end in a group sprint. It will then be the turn of the climbers to work on their GC positions one more time. with the next day’s time trial this is the last day for the pure climbers to gain seconds or minutes on their heavier opponents. With six categorised climbs between Lourdes and Lauruns, this 200-kilometre course offers enough options to do so. The final summit, that of the Aubisque (HC, 16.6 km at 4.9%), is at 20 kilometres from the finish line. With the climbs behind us, the final decision in the GC will be made in the time trial on day 20. The 31-kilometre course over hilly terrain is challenging and not made for the pure specialists. The descents are technical and there is plenty of climbing to face, most notably with the Col de Pinodieta (900 metres at 10.2%). After 21 days the Tour de France concludes with the iconic criterium on the Champs-Elysées in Paris. The 116-kilometre race starts in Houille and will most likely end in a royal sprint between all the fast men that survived the mountains and still feel fresh enough to charge for victory. Last year Dylan Groenewegen won here; can the Dutchman repeat this feat this year? The 105th edition of the Tour de France is set to feature many competitors that have the potential of fighting for the overall victory. After the closing of the Salbutamol case, Chris Froome can now focus on the objective of taking his fifth victory at the Grande Boucle, joining riders like Jacques Anquetil, Eddy Merckx, Bernard Hinault and Miguel Indurain. The rider will also attempt to complete the Giro-Tour double and win his fourth grand tour in a row. Froome has never hidden that the Tour de France is his favourite race and has proved to be almost unbeatable on the French roads. He will also have a strong team supporting him that includes riders like Colombian talent Egan Bernal, Wout Poels, Michal Kwiatkowski and Tour de Suisse winner Geraint Thomas. It remains yet to see if having one rider less will affect Sky's dominance in the race. Nairo Quintana will also be back at the race, one year after the failed Giro-Tour double in which the rider finished second in the first one, but was 15th in the second, at more than 15 minutes from Froome. The Colombian has changed his preparations and has started in few races in the current season in an attempt to find his optimal shape at the French grand tour. The biggest challenge for Quintana will be the shared leading position he has with Mikel Landa and Alejandro Valverde. It is unknown how the team will split the support between the three riders when the race gets more challenging. The route of the 2018 Tour de France suits Vincenzo Nibali as it is similar to the one of 2014, in which he took the overall victory. That year, the race also included a cobbled stage, which the rider and his team Astana exploited to the maximum by riding away led by teammate Lieuwe Westra and building an advantage over the direct rivals. There is the possibility that the rider would want to exploit that day in his favour. After finishing on the podium with an advantage of just one second over Mikel Landa, who ended fourth in the GC, Romain Bardet is back with a strong team and with the motivation of becoming the first Frenchman in 33 years to win the race. He has also shown to be in a good shape by finishing third in the Criterium du Dauphine. Other riders who can surprise at the Grande Boucle include 2017 Giro d'Italia winner Tom Dumoulin who was also second at this year's edition of the race, Richie Porte who has completely recovered from last year's horror crash and recently won the Tour de Suisse, Mikel Landa if he takes the leadership of the team with a good performance. Others to watch include Primoz Roglic who has had an outstanding season with victories in the Tour de Romandie, the Tour of the Basque Country and the Tour of Slovenia. Also, Geraint Thomas, Jakob Fuglsang and Alejandro Valverde have possibilities to shine in the race.